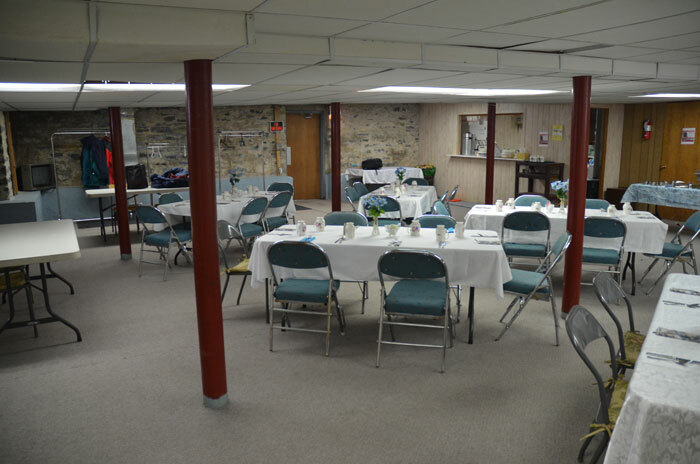 Munster United Church ‘facilities’ consist primarily of the sanctuary, a smaller size fellowship room upstairs, and the lower hall. The fellowship room is an open room with a counter and sink (for making coffee, tea, etc.) at one end and an adjacent accessible washroom. The lower floor consists of the hall, a kitchen, and a washroom (several steps to climb). The seating limit for the hall is 113 and we have tables and chairs for this number. 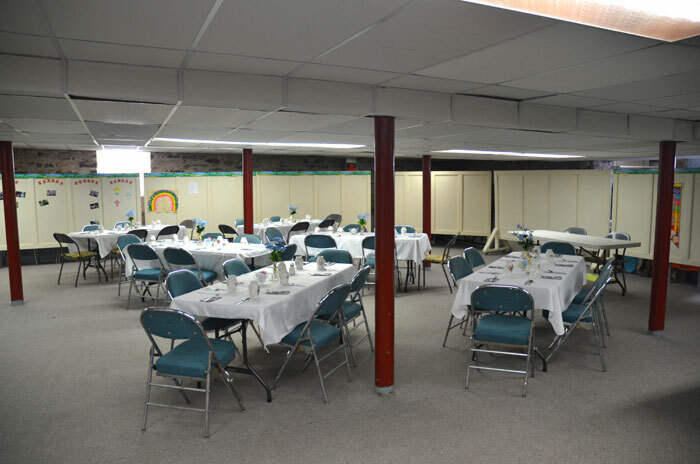 If you are interested in using or renting space at the church please send us a message using the Contact Us > Contact Munster UC page. Note that any use of the sanctuary other than regular worship services must be approved by the minister and Council. Please allow adequate advance time for them to meet to consider your request. 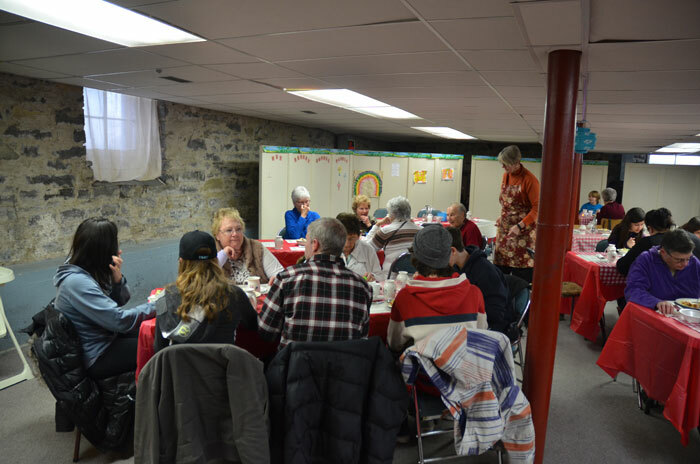 For the basement, use of cups, glasses, cutlery, utensils, coffee urn, pots, and other dishes requires approval by the Stewards and Trustees. 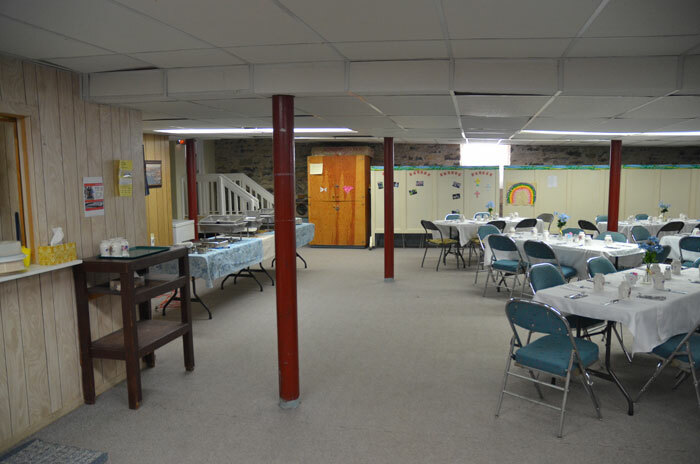 The following gives an idea of the basement layout, entrances/exits, and possibilities for table layouts. Tables and buffet serving table set up for group of 30. 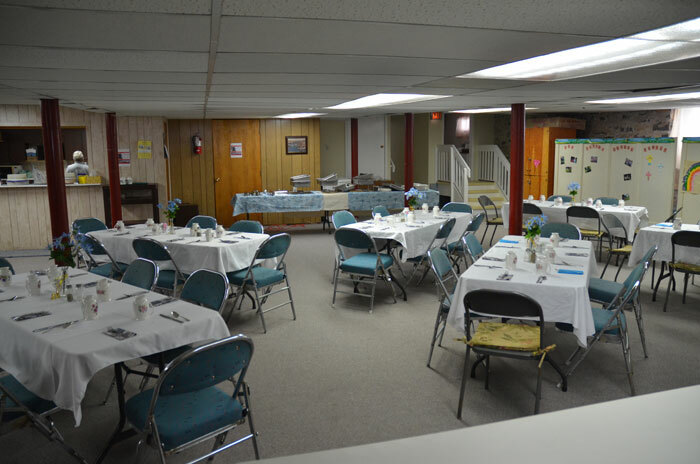 Tables and chairs set up for group of 30. Tables and buffet serving table set up for group of 30. Washroom is in right corner. Looking across tables and chairs to the kitchen. Looking toward the side netrance door. 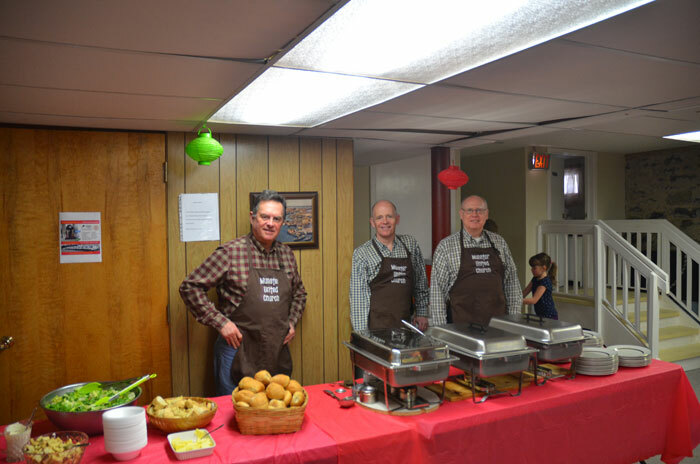 The buffet serving table at a spaghetti supper in March 2015. 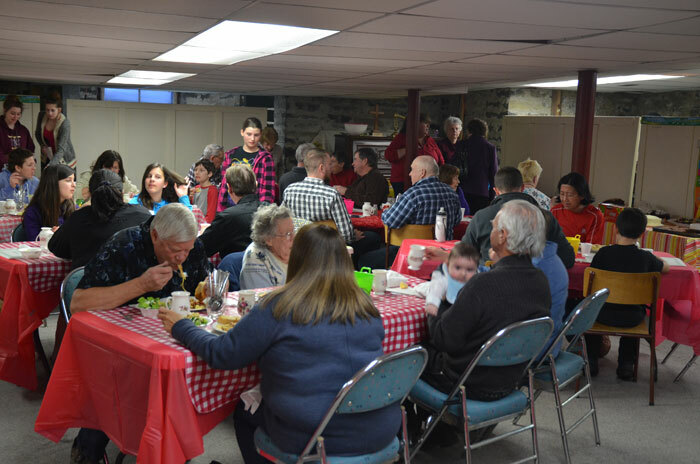 A view at the spaghetti supper in March 2015. 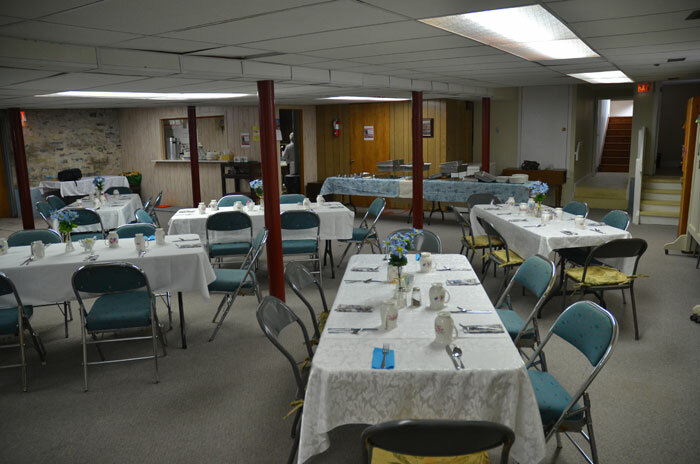 View of the centre area at the March 2015 spaghetti supper. Our kitchen facilities. 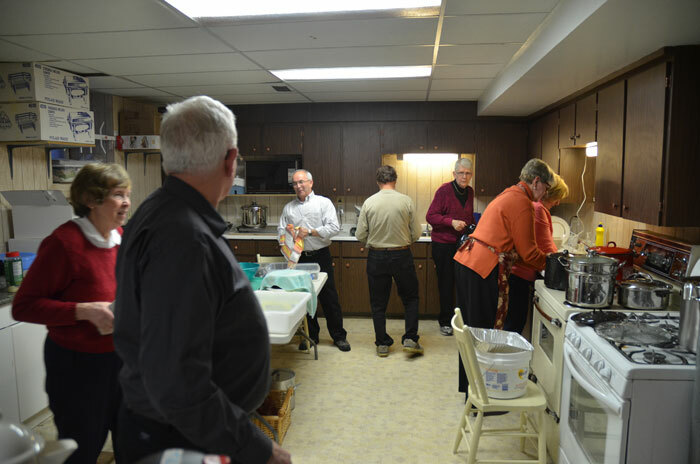 Includes two sinks, two stoves with ovens, a microwave, cutlery, galsses, mugs, serving dishes and utensils.